Blocking a Cell Receptor Could Protect Against Deadly Disease in Southwest U.S.
November 21, 2018—(BRONX, NY)—Hantaviruses cause severe and sometimes fatal respiratory infections, but how they infect lung cells has been a mystery. In today’s issue of Nature, an international team including researchers at Albert Einstein College of Medicine reports that hantaviruses gain entry to lung cells by “unlocking” a cell-surface receptor called protocadherin-1 (PCDH1). Deleting this receptor made lab animals highly resistant to infection. The findings show that targeting PCDH1 could be a useful strategy against deadly hantavirus pulmonary syndrome (HPS). The study was co-led by Kartik Chandran, Ph.D., Thijn R. Brummelkamp, Ph.D., at the Netherlands Cancer Institute; John M. Dye, Ph.D., at the U.S. Army Medical Research Institute of Infectious Diseases (USAMRIID); and Zhongde Wang, Ph.D., at Utah State University. Kartik Chandran, Ph.D., and Rohit Jangra, Ph.D.
HPS was first identified in 1993. A total of 728 cases have so far been reported in the United States, mainly in rural areas of western states. “While hantavirus infections are rare, they’re expected to increase in the coming decades as temperatures across the globe rise due to climate change. And we’re totally unprepared for this possibility,” said Dr. Chandran, professor of microbiology & immunology and Harold and Muriel Block Faculty Scholar in Virology at Einstein. Early HPS symptoms include fatigue, fever and muscle aches, followed after a week or so by coughing and shortness of breath. HPS has a mortality rate of around 40 percent, according to the Centers for Disease Control and Prevention. No treatments or vaccines are available. “Our findings provide new insights into how these infections develop and how they might be prevented or treated,” added Dr. Chandran. In seeking host factors that enable hantavirus infection, the researchers performed a “loss-of-function” genetic screen to see whether knocking out particular cellular genes could block hantavirus entry. The screen spotlighted the gene PCDH1, which codes for the protein receptor PCDH1 found on cell membranes. Strikingly, PCDH1 had previously been implicated in human respiratory function and lung disease but was not known to play a role in infection by hantaviruses or any other viruses. 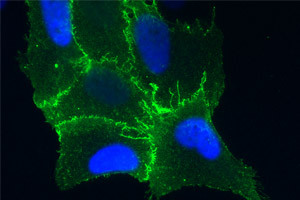 This cell from the lining of the lung is expressing the protein receptor PCDH1 (in GREEN), which is found on cell membranes. Hantavirus is transmitted to humans who inhale the virus from the urine, feces, or saliva of infected rodents. To confirm that PCDH1 plays a role in hantavirus infection, the researchers deleted it from human pulmonary endothelial cells (i.e., cells that line the lung). These cells became highly resistant to infection by the two major HPS-causing hantaviruses found in North and South America: Sin Nombre virus and Andes virus. Crucially, Syrian golden hamsters (the primary rodent model for hantavirus studies) engineered to lack the PCDH1 receptor were largely resistant to infection and lung injury caused by Andes virus. In contrast, most of the control animals, which possessed the receptor, succumbed to the virus. “Our findings establish a key role for PCDH1 in lung infections caused by hantaviruses in an animal model that captures key features of HPS,” said co-senior author Dr. Dye, chief of viral immunology at USAMRIID. Kartik Chandran, Ph.D., and Rohit Jangra, Ph.D.The researchers also pinpointed a specific part of the PCDH1 protein that is directly recognized by hantaviruses, making this protein region a promising target for drug development. Indeed, the team generated monoclonal antibodies with a high affinity for this region of PCDH1 that could bind to lung endothelial cells and protect them from infection by Andes and Sin Nombre viruses. Ongoing studies are evaluating these antibodies against hantavirus infection and disease in animals. Interestingly, a different group of hantaviruses that cause severe kidney disease in Europe and Asia and occasionally in the U.S. did not require the PCDH1 receptor for infection. “These viruses have other ways of invading cells that remain to be discovered,” said Rohit Jangra, Ph.D., research assistant professor at Einstein and a co-first author of the study. The study is titled, “Protocadherin-1 is essential for cell entry by New-World hantaviruses.” The other authors are: co-first author Rohit K. Jangra, Ph.D., Lara M. Kleinfelter, Megan M. Slough, M. Eugenia Dieterle, Ph.D., Elisabeth K. Nyakatura, Ph.D., J. Maximilian Fels, Melinda Ng, Eva Mittler, Ph.D., Sushma Bharrhan, Ph.D., Anna Z. Wec, Ph.D., Jonathan R. Lai, Ph.D., all at Einstein; co-first author Andrew S. Herbert, Ph.D., Ana I. Kuehne, and Ariel S. Wirchnianski at USAMRIID, Fort Detrick, MD; co-first author Rong Li, Ph.D., at Utah State University, Logan, UT; co-first author Lucas T. Jae, Ph.D., at The Netherlands Cancer Institute, Amsterdam, The Netherlands; Sarah L. Barker, Ph.D., Jason Moffat, Ph.D., James Pan, Ph.D., and Sachdev S. Sidhu, Ph.D., at University of Toronto, Toronto, ON, Canada; Pablo Guardado-Calvo, Ph.D., Gleyder Román-Sosa, Ph.D., and Félix A. Rey, Ph.D., at Institut Pasteur, Paris, France; and Nicolás A. Muena, Ph.D. and Nicole D. Tischler, Ph.D. at Fundación Ciencia & Vida, Molecular Virology Laboratory, Santiago, Chile. This work is supported by funds from the National Institutes of Health (AI101436, AI132633 and AI125462), U.S. Joint Science and Technology Office/Defense Threat Reduction Agency, Netherlands Organisation for Scientific Research, Cancer Genomics Center (Netherlands), Ammodo KNAW Award for Biomedical Sciences (Netherlands), Integrative Biology of Emerging Infectious Diseases Labex project (France), Investissements d’Avenir program (France), Canadian Institutes of Health Research, Comisión Nacional de Investigación Científica y Tecnológica (Chile), and the Irma T. Hirschl/Monique Weill-Caulier Trust.